The picture on the old postcard above shows a typical village green from the lower Danube plain region of Romania at the turn of the 19th century to the 20th century. 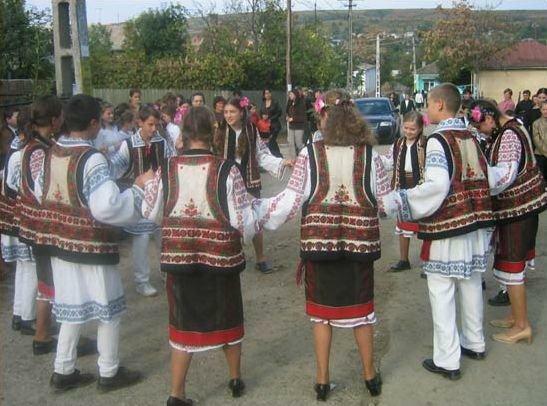 The scene is that of a Sunday dance, or hora in Romanian, an energetic round dance where eligible young peasant men and women met and danced together in their Sunday best (clothes made of homespun cloth, richly embroidered with ethnic motifs). The custom is still preserved in many of Romania’s villages, especially in the more isolated mountain communities. The Sunday dance was a very important village event, even more important than the church service in which the local landlord also often participated together with the estate administrator and their families. On the left side of the photograph above, we can see a covered horse carriage, which most probably belonged to the local land owner, the boyar, the wealthiest local, who came from his nearby country mansion, or conac. Next to it, there is another somewhat more modest carriage which probably belonged to the estate administrator, the arendas in Romanian, and further to the right is another really modest horse drawn carriage which probably belonged to one of the local state officials like the teacher or policeman. In the middle of the round dance, the orchestra plays. It was usually a gypsy band comprised of musicians from the local gypsy community, descendants of the former estate slaves, an ethnic group that was freed by the state only in the mid 19th century, after half of millennium of slavery. They are playing the instruments common to this region like a portable zimbalon, violin and lute, etc. On the right side of the photograph, there are two ladies in the town dress of the 19th century who keep a formal distance from the peasants; they are presumably members of the landlord’s family. There are, however, some people in the crowd in town dress that mingle happily with the peasants. The village green is surrounded by an assortment of peasant houses, in the foreground two modest, basic houses with thatched roofs, typical of very poor peasant families. Next, on their right is the fence surrounded courtyard of a wealthier peasant with a better house with a shingle covered roof. The photograph offers a wonderful glimpse into a happy moment in the life of a Romanian village at the height of the Victorian era. It is also a useful record of the time giving insight into that the psychology and way of life of the Romanian peasants for anyone interested in visiting these areas or buying a traditional house there.